Keeping guests safe and ensuring their privacy is important for any resort destination. This is why using the right type of security fencing and gates can be the difference between success and failure. When it comes to secure fencing, chain link is one of the best options around. Even among high-end resorts, chain link fences can i a useful and appealing place thanks to the many benefits it can provide. 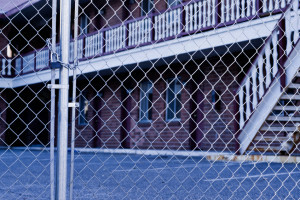 Visually appealing is not a phrase commonly associated with chain-link fences, but the truth is that chain-link security fences truly can add to your resort’s external appearance. Chain link can be painted and coated in various styles, colours, and materials, allowing the fence and gate’s appearance to blend in, accent, or stand out against the rest of your resort as you see fit. In this manner, chain-link fences can be both fashionable and highly functional. Guests at resort properties expect a certain amount of privacy, especially if parts of the resort border areas of public access. Chain link is a highly customizable material, particularly for resort security fencing and gates, and although it is known as one of the more transparent types of fences thanks to the holes, this does not always need to be true. The mesh used in a resort chain-link fence can be adjusted to varying levels of thickness in order to produce a bulwark against any unwanted eyes or ears. Chain-link fences also mark clear do not cross lines to separate public and private boundaries. Big resorts will inevitably use a lot of fencing, so you will want a fence that does not require constant inspection, maintenance, or repair. For these needs, chain-link fencing is the optimal choice. A chain-link security gate and fence can withstand harsh weather (hot and cold), high winds, heavy rain, physical impact, and more. In the event that repair or replacement ends up being needed, sections can be mended or replaced with minimal effort and cost. The type of security gate you use for your resort is going to depend on the needs of an individual area, and you will likely end up employing a number of different gates throughout your property. Here are some of the main chain-link gate options currently available to help inform any decisions on the matter. This type of chain-link security gate makes use of one or two sets of wheels that allows a section of the fence to be moved along a track. Since a sliding fence gate doesn’t swing out or in, it can be useful for any area where space is a concern or if the gate is large and could swing out make it a safety issue. Car parks, for instance, like to make use of sliding fence gates that are designed to open automatically and remotely. This is the traditional type of chain-link security gate and is the one most people immediately think of. A swing gate is essentially a door in the fence that can be swung open to allow for access. These types of gate are useful in a wide variety of situations and areas, so long as there is adequate space available. A walkthrough gate is best imagined as a subtype of a swing gate. Walkthrough gates are designed to provide an entrance only big enough for a single person to pass through at a time. For a resort, chain-link gates of this type are useful for situations in which you want to funnel guests through a specific section or otherwise restriction who or what can enter or leave a certain area. The expert contractors at Total Fence Inc. provide residents, businesses, and industries of the Greater Toronto Area and beyond with quality chain-link fences and security gates as well as repair, installation, maintenance services, and much more. Our professionals are among the best in the field and are committed to quality in all efforts. To learn more about our fencing services or to get a quote, feel free to contact us by email at info@totalfenceinc.ca or by phone at 416-239-5362.